For Joseph Sears, a 2015 Michigan State University School of Criminal Justice alumnus, becoming a police officer was something he’s always wanted to do. 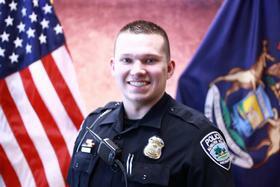 Prior to becoming an officer for the Auburn Hills Police Department, Sears graduated from the 97th Class of the Mid-Michigan Police Academy, where he received awards in driving, report writing, academics, marksmanship, and weapons management. His time at Michigan State prepared him for such success. The School of Criminal Justice at MSU is the home of the oldest continuous degree-granting program in Criminal Justice in the U.S. In addition to more than 200 programs in undergraduate, graduate, and professional studies, MSU has upwards of 900 student groups and numerous on-campus employment opportunities, all of which Sears took advantage of. Now, as an Auburn Hills Police Officer, Sears works alongside other Spartans who have graduated from MSU in the School of Criminal Justice as well. All of whom work every day to keep the city safe.